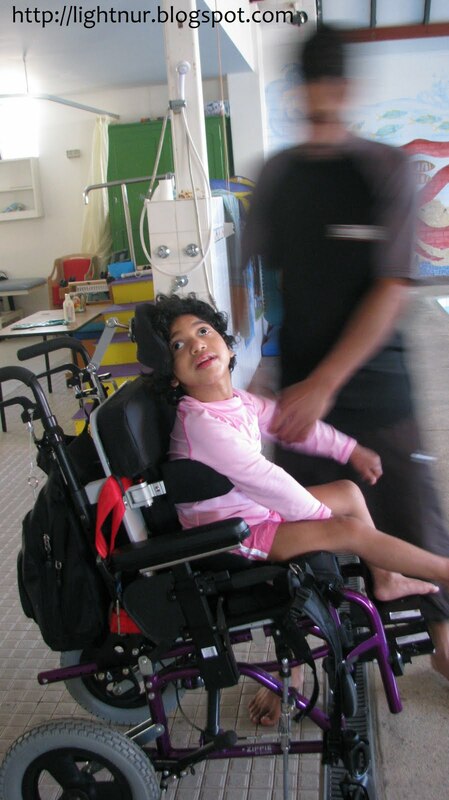 For a special needs child or children with motor disorder like Mujhee a wheelhair is a freedom for mobility. I wish it is temporary for Mujhee because she is learning how to walk through a system of education called conductive education. I am so grateful that she is given an opportunity to learn how to walk, but meanwhile a wheelchair is a must for her. It was more than two years ago when I decided to get Mujhee a wheelchair as she has not shown any signs of walking. It was a hard decision to make because I really wish that she is able to walk like my other children. With the help from Mujhee's OT at TCCP that time, I decided to get her Zippie wheelchair. Mujhee is moving around using a wheelchair. She started using it about a year ago since February 2009. It took about 5 apointments until she finally got it. The most important part about the wheelchair is the seat is custom made. Mujhee is learning how to sit without support but she still needs support for sitting. For that reason she needs a custom made special seat to go with her wheelchair. Now the seat is too small for her and she looks squashed in it. It is time to modify the seat as she is growing, especially the head support and leg support because they dion't povide the support that Mujhee needs. Alhamdulillah, it was quite a long wait from Dec 2009 until we got an appointment for March 2010 at TCCP Tech to review Mujhee's wheelchair. I heard that there is some changes at TCCP that makes it's services run a bit slow, meaning a long waiting list. On the appointment day (18/03/2010) Mujhee's Occupational Therapist, Lisa from Therapy Focus and her previous Teacher/Conductor, Shona from Carson Street School accompanied us to the appointment. I was so happy they came with us and giving us so much suggestions on how to upgrade the new seat. At the moment Mujhee's OT will apply for the fund according to what her new seat will be and insha Allah when it is granted TCCP Tech can proceed with the making of the seat. There will be a couple of months waiting period until the funding is available. I know it seems long and I wish she could get her new seat right away. It is not only the wheelchair, there are few more equipments that needs to be upgraded like a standing frame to help her stand and a shower chair for washing her everyday. I find the costs are hard to cover because the cost of having a child with disability are way too high. For me waiting is great as it teaches me to be patient during times of hardship without complaints. I remember a verse in the Quran that states that "Indeed Allah is with those who are patient." Al Baqarah 2:256. So what more would I want?